I love that the addition of one word can turn a sloppy one-pot meal into something refined. 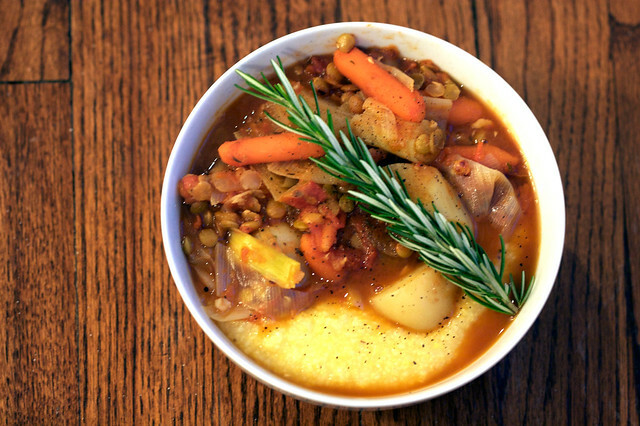 The word, of course, being “rustic.” This is a hit-the-spot stew for wintertime, and the addition of a soft, simple and creamy polenta make it pure comfort. Even though there are lentils, I wouldn’t call it a “lentil stew.” The lentils are there to add extra body and some meatiness. Chopped plum tomatoes ensure a fresh tomato taste, as opposed to a heavy handed tomato-from-a-can flavor. Go for yukon gold potatoes that are about the size of a misshapen golf ball, that way you only need to slice them in half to prep. Baby carrots are especially helpful, too., if you’re feeling too lazy to slice carrots. Of course if you don’t want to use polenta you can use mashed potatoes, rice or any manner or yummy starches. Preheat a 4 quart pot over medium heat. Saute the onion in olive oil, along with a dash of salt, for about 5 minutes. Add the garlic, thyme, celery seed, pepper and salt and saute a minute more. Add potatoes and leeks. Lower heat to simmer. Cover and cook for about 20 to 30 more minutes, until potatoes are fork tender and lentils are soft. Let sit for 10 minutes or so to allow the flavors to meld. Serve over polenta, garnished with fresh herbs, if you like. Bring vegetable broth and salt to a boil in a 2 quart pot. Add oil. Lower heat to simmer. Add the polenta in a slow steady stream, stirring constantly with a whisk. Whisk for about 5 minutes, until polenta is thickened. Keeping heat low, cover and let cook for 20 more minutes or so, stirring occasionally. Isa, I SO ♥ you!! Yum, making this tonight. Have everything in the house but polenta. it looks delicious, but… fresh tomatoes in a winter stew? This looks delicious! I’ve yet to try polenta at home. Added to my recipe list! Go for whole grape tomatoes, if your grocer’s supply of fresh plum tomatoes are sharing a kinship with cardboard. Or try compari tomatoes. They’re sort of a large cherry tomato, and delish at any time! So… I made this yesterday… it was AMAZING. Seriously fantastic. A wonderful wintery-fresh brew of toothsomeness. I made this for dinner earlier this evening – so tasty! There also happened to be two meat-eaters at the table who enjoyed it muchly. I couldn’t find dry polenta, so we had it with ready made polenta. Mmm. This is going to be my xmas dinner! Suze is right. seriously fantastic and wintery-fresh. stick to your ribs without being a leadweight of starch in the belly. smells like comfort, looks like comfort, tastes like comfort…well, it is. YAY! Made this tonight for dinner and it was a huge hit. Not really winter-y down in South Florida hey we can still eat like it 20deg. outside. Sorry if this is stupid question but do the bay leaves go in with the lentils and carrots or with the potatoes and leeks? Or does it even matter? Thanks again Isa for another awesome dish. You should throw the bay leaves in with the lentils and broth. It probably doesn’t really matter but since you don’t eat them, the longer they sit in there the better. I wouldn’t saute them with the other herbs but I don’t know if there’s any real reason not to, I just always add mine to liquid. dried. I didnèt even have onion, veggie broth, or roma tomatoes (instead of them I used some terrible ones we had gotten – classification unknown….and still, voila. tres bien. Delicious, warm and filling. I added fire roasted tomatoes along with diced plum tomatoes to add heat. I made the stew and polenta early in the day. I lightly greased a bread pan and poured in the hot polenta. Once cooled I refrigerated it. At meal time I sliced room temperature polenta into the bowls and ladled the hot stew over it. This was great! Great comfort food. My three year old claimed, “yummy in my tummy”. Thank you. I stuck to the recipe, which I rarely do (but, of course, that means putting in lots more garlic than called for). It was wonderful. I hosted a small dinner party with this as the main course. Guests were asking for second servings. I will make this again, or maybe not, because now I am curious to try other recipes on this site. Brava, Isa! This was great and so filling. Halved the recipe and still had leftovers. For the person who said they couldn’t find polenta, just use cornmeal! You can get that anywhere! i just tried this recipe. it’s great, definitely one of my new favorites! Made this tonight and hubby and I give it two big thumbs up. The only thing I changed was to slice up the leeks so I could use most of the leaf instead of just the tender parts! Thanks so much for a wonderful dinner recipe! Turned out great! I used boxed chopped tomatoes and rosemary instead of bay leaf (didn’t have any), which worked ok but I’ll use bay next time. I also increased the lentils. The polenta accompaniment worked very well. Next time, I’m going to add kale at the start of the simmer. A keeper! Isa I think you are a genius, and you have revolutionized vegan and vegetarian cooking and baking. I have been lovin’ the cupcake and cookie cookbooks for a while now (made the applesause softies just the other day – such a perfectly mellow cookie! ), and recently discovered your blog. I made this stew tonight and it was great! Thank you for your creativity, your easy-to-follow instructions, and for sharing your passion and talents with all of us. I am pretty new to cooking, and with your recipes I feel empowered and confident to dive in and cook, and it always turns out yummy! Thank you! Thank you so much, that is so good to hear! This looks like a good autumn dish. I am looking forward to making this when it starts to get cold outside! Thanks, Isa! I love your recipes!!! just got leeks in my csa this week and i have everything else in the fridge…you make menu planning so easy! Is there a substitute for the lentils? Maybe a white bean or kidney bean? My daughter is allergic to lentils and chickpeas. Thanks! Lentils cook much faster than either of those, but sure, it’s pretty flexible! I tried this with winter squash and sweet potatoes I’d baked in the oven instead of the polenta and it was delicious. I just mashed the squash and potatoes with a bit of salt and cracked black pepper and added it to the bowls of stew. That really contributed to the flavor. Next time I may have to try it with the polenta, though, to see how that tastes. It looks good and creamy. YUM! I made this for dinner tonight and it was a hit. Neither of us had ever had polenta before and I have major texture issues so I was a little concerned, but, it was totally delicious! We are just getting our toes wet with this vegan idea.. We watched ‘Forks Over Knifes’ and decided we better give it a shot. Anyway, your blog has been very helpful.. thanks for all your great recipes and ideas. ‘Forks Over Knives’ also brought me and my husband to this diet and a friend lent me Veganomicon. After cooking mostly Isa’s vegan recipes for almost two months now I can say we have always left the table feeling happy and full. This recipe is no exception. I cooked it tonight and it was perfect for a November evening. My husband was really on to something when he suggested we add some Trader Joe’s vegan soy chorizo to our hot bowls of stew. Come January I imagine we’ll be eating this every week. Thanks, Isa! I have been vegan since March, but this week was the first time I tried a vegan recipe out on my (non vegan) husband. And it was my first exposure to PPK. This dish is absolutely delicious!!! And my husband also loved it! This was sooo good! Added some tempeh, used sweet potato instead of regular potato. Went back for seconds and thought about thirds. So glad there are lots of leftovers! This made my day–perfect treatment for sniffles and a sore throat. Trader Joes made things a bit simpler for us with their cooked lentils (which I forgot to add) and pre made polenta (which I sliced and panfried). Such a tasty broth–amazing how good simplicity can taste. I added fresh cilantro to the finished soup for serving as cilantro rocks my world. I will definitely make this for years to come! I found your site through Feed Yr Skull!!! (another yummy veggie/vegan-ish/raw webby)….I just finish making this dish though substituting leeks for eggplant and white navy beans for lentils and instead of veggie broth I used red miso paste……TTTTTTAAAASTTTTTTYYYYY!!! Thank you!!! SO HAPPY to discover yr site! My husband and I were in heaven!!!! Perfect dish for the winter season….so hearty, deeeelish and healthy…VERY SATISFYING…CANT RAVE ENUFF!!!! I have made this several times now. We really love the flavors. I wound up adjusting the spices to our likes using basil, sage and a little thyme. The polenta makes this so comfy and filling. I used chopped canned tomatoes in juice, adding less broth to compensate, as well as added a bit of fresh parsley and extra thyme instead of celery salt. Even with my modifications, it was like pure comfort on a plate. Thanks for creating such foolproof (adaptable!) recipes that never disappoint. Yum! Pour anything over polenta and I am totally on board! Thanks for sharing this tasty recipe that I can force meat-eating family members to eat. We’re all big polenta fans as it is. I’m making this for dinner tomorro! Wow! So good. After this meal, I decided I need to put together a binder with “All time favorite recipes”. This will be the first recipe I add to my binder. help !!!! i need to prepare a vegetarian main course !? Made it, loved it, blogged it! Thanks for sharing! I just made this but forgot tomatoes, didnt have any canned, so i skipped altogether, and added celery and a dash of vegan Worcestershire sauce. Also only had the polenta tube so decided to pan fry slices in a little olive oil. I loved this meal. So did my husband. Will be making again soon! Really good, but the polenta would be better cooked with water, and not vegetable broth. it turned the polenta into a brown color – not like the picture. Minor change for next time. So, so good! Warm and rich and tasty. It will be my lunchtime stress relief for the work week! Thank you! Made this for dinner two nights ago. Am heating up left overs and making a fresh batch of polenta to share with my hubby for lunch. This recipe was amazing. It even passed the kid test. Wouldn’t change a thing, although I did use different tomatoes. Thanks so much for an amazing recipe. Oh man! I was reading the directions while cooking and realized that it doesn’t say when to put in the bay leaves in the directions and I didn’t realize it until it probably doesn’t matter anymore. Should still be good tho. Follow up: I added the bay leaves in the last 15 mins of simmering and the flavor was still delish! Also, my potato’s were looking pretty sad, so I replace with a sweet potato and added a parsnip. All in all, this will be my go to ‘rustic’ stew recipe for sure! Didn’t have Thyme so I used Tarragon instead, and it was fantastic in it!! Also added diced kohlrabi in with the carrots, and made the polenta with garlic similar to the blackened scrambled tofu recipe. I’ll be making this now in place of my usual vegetable stew! Delicious! This was one of the most delicious meals I have ever made. My boyfriend and I went nuts for it! Just incredibly tasty, nutritious, and satisfying. My type of comfort food. This is the dish that finally won my boyfriend over on leek and it will no doubt be made again and again in this household. Winner winner vegan dinner! I made this but added turnips, rutabeggas, and parsnips…then sauteed mushrooms. in butter with shallots and garlic…then, served over polenta….it was so yummy! Mmmmmmmmm. Delish. Thank you isa for always feeding me. Someone literally told me today that I’m not a pale sickly vegan haha. My stupid grocery store didn’t have dry polenta so I used prepared (tube=weird) but mashed it w almond milk on the stove and came out not weird but yum. Savory delicious meal. Rustic Winter Stew Over Polenta, and Meet Curly the Pekin Duck! Don’t mean to be nitpicky, but it doesn’t say here when to add the Bay Leaf..